Don't let your keyboard and mouse get in the way. 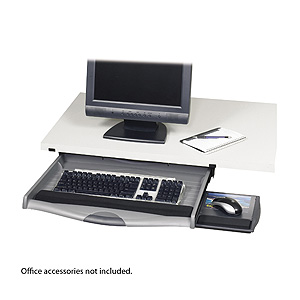 Heavy-duty molded plastic keyboard drawer mounts directly under any surface enabling valuable desk space to be freed up for other activities. Drawer locks into keying position on ball bearing glides for smooth movement in and out. Unit features three height positions with two tilt adjustments. Mouse tray easily slides out for right or left hand use. Clear Lexan® mousing surface lifts up to display meeting reminders, memos or personal photos. 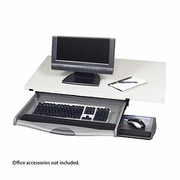 Soft-grip drawer handle provides easy access to the keyboard drawer. Padded wrist rest is removable to accommodate ergonomic keyboards. Mounting area measures 25-1?8"W x 16"D. Mounting hardware is included. Black keyboard and mouse wrist rests.